The other day I was thinking about how great 2016 was, and how not on fire everything was. It was truly a delightful time. Reflecting on where House Rules has been has been incredibly educational on how I can do things better this second time around. When I launched the first campaign for House Rules, I was mostly shooting from the hip trying to see if I could get the game to stick. It seemed so easy, that you could just throw any old game up on Kickstarter and it would explode brilliantly with success, fame and fortune. Tragically this is not the case in the board game biz. For every success, there lies corpses of dozens on casualties that didn’t have the right stuff. While I had a game that dozens (dozens!) of people enjoyed and wanted a copy of, I failed to set it up to succeed in the market where there are many more games vying for attention. So, lets crack this melon open and take a hard look at the innards to see what went wrong the first time. The first House Rules campaign was doomed before I even pressed the GO button. Why? I underestimated the importance of a strong launch. While I shared the h*ck out of the campaign on Twitter, emailed my playtesters, and harangued my friends and family about my game, I did not get involved with the board game community and share it with reviewers, bloggers and podcasters. I somewhat arrogantly assumed that the community would come to me once the campaign was underway. I did not value the difficult skill of marketing. If I could do away with one thing in the world, it would be commercials and advertising. I guess that’s two things, but anyways. They are very demanding of my attention, and they are ubiquitous. I think of Alex Trebek informing me of all the benefits of life insurance or Lebron James drinking Sprite. I’ve never really understood why attaching a celebrity to a product makes it more desirable; knowing that someone got paid to speak well about a product doesn’t really impact my decision to but it or not buy it. If anything, I assume there is something wrong with a product if it needs a famous person to endorse it. Before the campaign, I looked into getting a few reviews of the game, so that I could have third parties endorse it and validate it. While I was looking, I saw that a lot of review services were paid. This felt weird to me; it seemed akin to having paying for an endorsement. I felt that having money involved in the transaction would bias someone’s opinion of my game (shocker I know) as I sought out objective opinions about the game. What I failed to recognize is, while paying for a review of a game can bias the opinion of a reviewer, you aren’t paying for an endorsement. You are paying for their time, and potentially their platform to tell people that have placed their trust in their opinion. If I gave a reviewer a copy of tic tac toe, I don’t think I could pay them enough to have them lie to me about how great it was. So, this time around I had prototype copies ready to send out to those gracious enough to play the game and tell me what they thought of it. The original iteration of House Rules used player elimination as its victory condition. If you ask any board game player what their least favorite game is, chances are they are going to tell you Monopoly. One of the bummers about Monopoly is its player elimination mechanic. I’m sure everyone has played this game only to have the game come down to two players trading blows for what feels like hours while the bankrupt players watch from the sidelines. It’s just adding insult to injury. Risk also has the same issue. 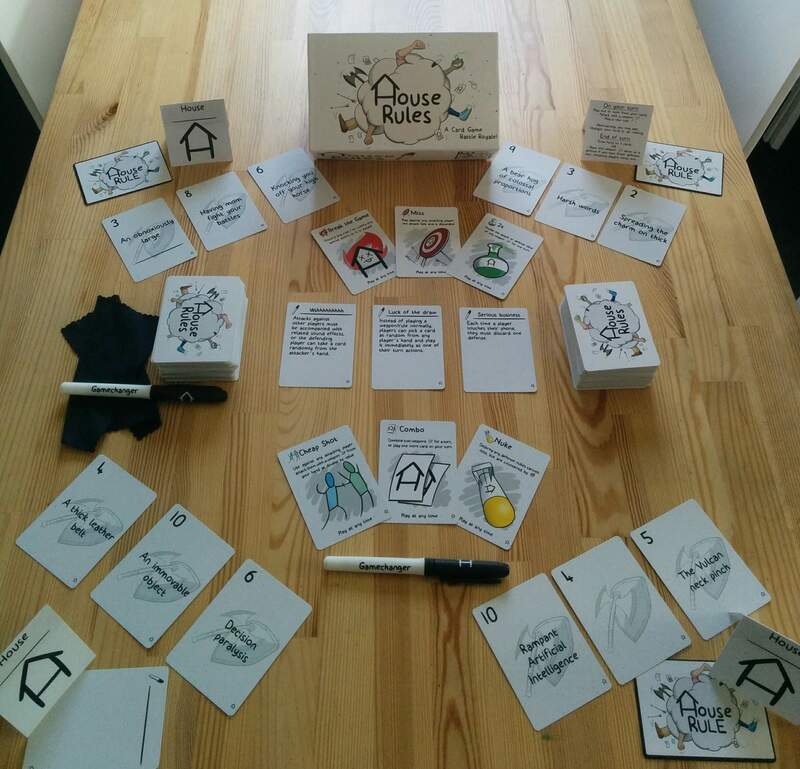 I designed the endgame for House Rules so that once one player went down, the game resolved within a few more turns. While this worked mechanically, it still involved a little downtime for one or two players. I also discovered another feature that comes with player elimination as it’s victory condition: playtime variance. I had playtimes that completed in 30 mins, while some lasted more than an hour. These two factors combined made the experience wobbly. I concluded that in a player elimination game, the best case scenario for any player is that they are able to play an entire game. There are some games that can use player elimination well, but ultimately House Rules goofy nature didn’t mix as well as I’d hoped with the player elimination mechanic. In its place, I broke the game up into several small rounds that retained the core element from the game. While each round has the potential to crown a last player standing, the victory condition is the player who did the best at balancing their offence and their defense and collected the most weapons. Ok so that’s good and all, so what took so long until the relaunch? A couple things. After the initial campaign, I decided to try to find a publisher in its old form. I spent the rest of the year hitting the speed dating circuit and shopped the game around publishers. Ultimately I didn’t find a good fit. It wasn’t all in vain though, I learned a lot about the structure of the tabletop gaming ecosystem. I also learned my approach to telling people about the game was all wrong. While I was great at explaining the game, I was pretty bad at selling the story of the game. I found that it was a hard sell for the game with player elimination mechanics in the current market, so I knew I needed to address that before taking another crack at it. Then some real life happened. In 2017, my wife and I had a baby, Molly, who is incredibly adorable. This put design work on the back burner for a bit, but I still knew what needed to be addressed. Once our lives were back in a semblance of order, I went about redesigning the game again. Earlier this year I got the opportunity to take the new and improved House Rules to the GAMA trade show where there were going to be publishers galore and ample opportunities to schmooze and show off the game. I had a few publishers express interest and evaluate the game and I got a lot of positive feedback about it, but it just wasn’t going to be a good fit for their brand. A few months ago, I decided that the game is too much on the weird side for a publisher to take a risk on. The publishing game is built on safe bets, and I was going to have to change a lot about my game if I wanted to fit it in. I’ve always been a more hands on individual, so I decided that the finding a publisher wasn’t going to be the best way to getting the game out in the wild. So that brings us to now. I’m going to put everything I have into getting this beast out there. Next time on the blog, I want to dig deeper into the mechanical changes to the game and reveal some of the nuances of combat.